I made a new dress last weekend! This is a sleeveless Colette Laurel that I modified to have pockets(!) and a notched neckline (using this free hack). I’ve made a few sleeveless Laurels before, and the main attractions (besides looking nice) are that they’re fast to make and don’t use very much fabric. I had about 2.5m of this fabric, but it’s a quilting cotton and thus very narrow (less than 45″ wide). 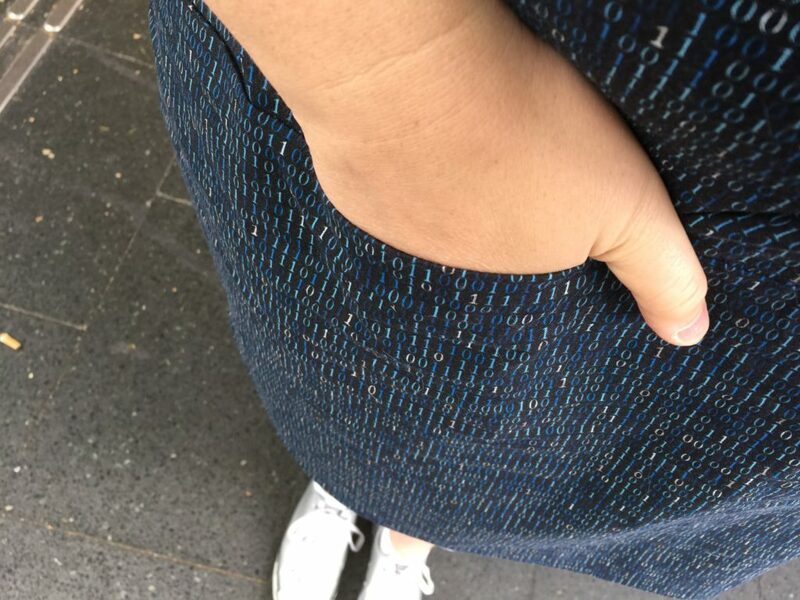 It’s navy blue and covered with a stream of binary numbers in light blue and silver. (So cute!) It’s called “Binary Solo” from RJR Fabrics’ collection “Silver Circuits.” My Mom made a point of showing it to me at her shop back in Indiana, and I just had to have it! 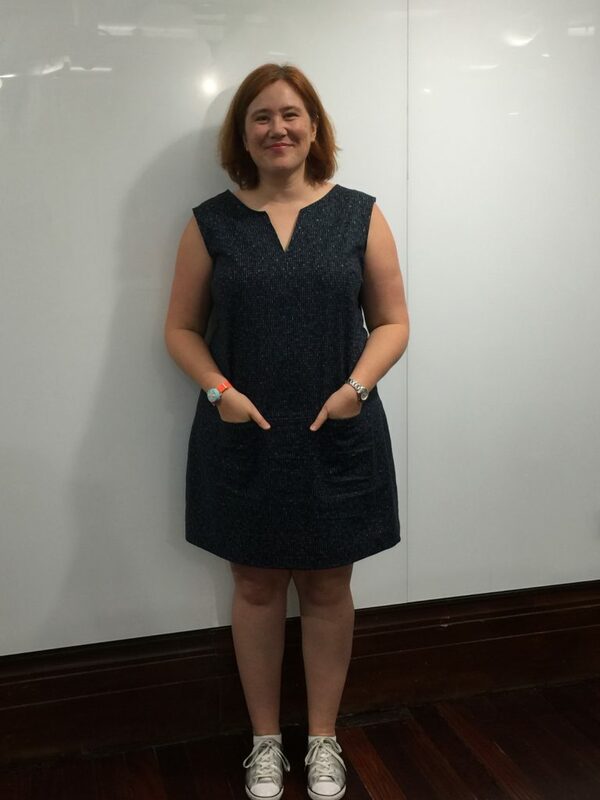 I’m calling it my “Big Data Dress” because, as Juliet Houghland pointed out at YOW! Data recently, all stock images of “Big Data” are blue and involve binary. 😂 I wore it to Girl Geeks last night and it was a big hit! What I’d do differently next time: I’m not sure why the back piece needs the corresponding horizontal seam. Maybe it’s because Sarai made hers out of linen, so it’s more visible and looks weird if it’s not there? But my print is so busy that I could have easily left it out and saved myself some cutting and sewing time. I’d also move the pockets out a little bit further as the 2.5″ from center she suggests seems a bit close for me. Lastly, I’d probably consider putting some interfacing behind the neck notch. (I still might do that, actually.) I noticed when I was wearing it yesterday that one side wanted to flop forward and fold down occasionally, so a little bit of extra stiffness there couldn’t hurt. Overall I’m very, very happy with this one! It’s cute, comfortable to wear, and a real conversation starter.